The Nokia Lumia 830 is a stripped down version of the Lumia 930. When I first saw the Lumia 930 (Lumia Icon), I knew that it was great design, because it didn’t have the camera protrusion at the back and it was sleek and stylish with its metal body. It didn’t have the monstrous 41 megapixel like the Lumia 1020, but it was a 20 megapixel PureView camera. But still it is a thick device to hold in hand. The Lumia 830 has the design sense inherited from the Lumia 930 and 925. 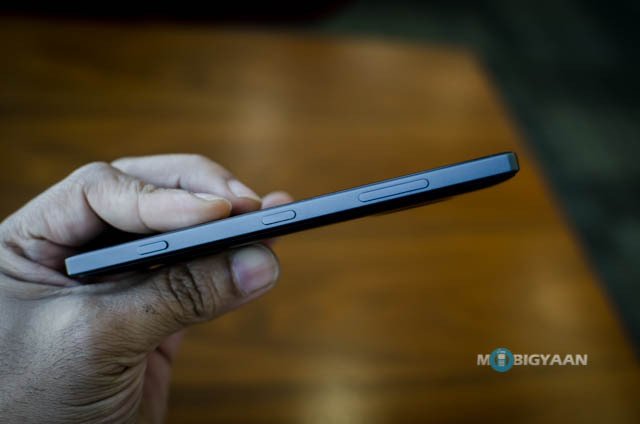 It is very slim at just 8.5 mm and has a robust metal rim encircling the chasis. It is a stripped down version of the Lumia 930, in terms of hardware specifications and is much cheaper. I have been using the Lumia 830 for quite some time now and let me tell you my thoughts about this device. The design quality of the Lumia 830 is the best I have seen in the Lumia line up so far. It feels very sturdy and looks quite appealing. The metal rim and the polycarbonate shell gives it a premium feel. At the back, the case can be removed. It is made of flexible plastic and available in bright orange, vibrant green, black and white options. It is very light at 150 grams and yet it feel quite solid in the hand. The back has the 10 MP pureview camera with carl zeiss lens and assisted by a single LED flash. The back panel when removed, reveals the noise cancelling dual mics, user replaceable batter, Nano SIM card slot, microSD card slot and the mono speakers. The back panel has the induction coil circuit for wireless charging. I am quite amazed that inspite of having expandable memory, user replaceable battery and also wireless charging, the device manages to maintain its slim profile. The buttons are also made of metal and the tactile feedback is pretty good. The Lumia 830 has a 5 inch LCD display that is capable of 1280 x 720 pixel resolution. This results in a pixel density of just 293 ppi. It doesn’t have HD display and yet I felt that the graphics rendering is quite sharp. The display is slighly exposed as it is placed above the body of the mobile. But it is protected by Corning Gorilla glass 3 and also the edges are smoothly chamfered. The touch responsiveness is very smooth. The sunlight visibility and viewing angles are appreciable. For a device in this price range, the display is of decent quality. Lumia 830 is powered by 1.2 GHz Cortex A7 processor on a Snapdragron 400 chipset and has 1GB of RAM. It has a dedicated Adreno 305 processor for graphics. The internal memory is 16 GB and can be expanded upto 128 GB. The specifications are not top notch, but it performs without any glitch. It handled most of the applications and games with utmost ease and the device never heated up. I was pleasantly surprised at the performance of the Lumia 830. The mobile ships with Windows Phone 8.1 Denim update out of the box. The denim update brings in a lot of tiny but noteworthy changes in the user interface, like the grouped live tiles. It is optimized just right for the hardware specifications. There is not lag in the UI and the performance of the software goes hand in hand with the performance of the hardware. HTC ultra pixel sensors have proved that, for a good quality image, one does not need megapixels but the right set of software algorithms. 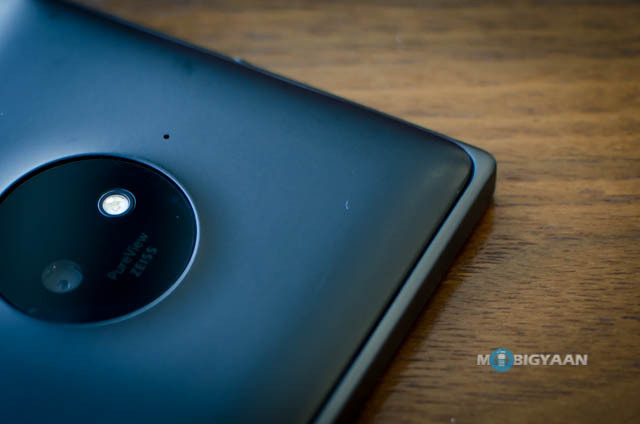 Nokia has traditionally combined both megapixels and software algorithms to create some of the best camera mobiles in the history like the Nokia 808 and Lumia 1020. This combination is branded as PureView. The PureView technology is implemented in Lumia 830 with its1/3.4in size 10-megapixel sensor. The Lumia 830 has the smallest optical image stabilization system in a mobile phone ever. The 6 lens system has an aperture of f/2.2 and a focal length of 26 mm. The back side illuminated sensor and the wide aperture makes is an ideal camera for low light situations. The minimum focus distance is 10 cm which means that you can take awesome macro shots with it. All this complimented by the Nokia Camera applications, makes the Lumia 830 a great camera mobile. 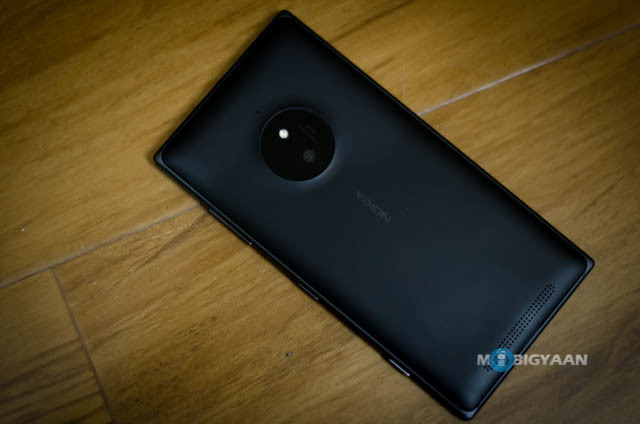 There are a host of new applications like the Lumia Selfie, Lumia Panorama with the older applications like the Nokia Refocus and Nokia Cinemagraph. Nokia has tried to bundle them with the Nokia camera, terming them as “Lenses”. But I feel that the term “Lenses” is quite misleading and the integration is disjoint, as it is just a link to the other application. 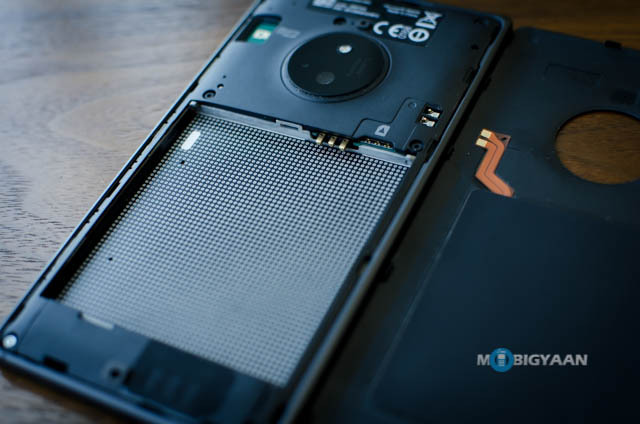 These applications can be tightly integrated into the Nokia Camera similar to what was done to the Nokia Pro Cam and Nokia Smart Cam in the past. The primary camera can record full HD 1080p videos at 30 fps. The quality of the image captured is really appreciable. The image captured has incredible details and the colors are quite natural.The contrast and saturation is just right and overall the picture quality is good both under daylight and low light conditions. The front facing camera is 0.9 MP wide angle with f/2.4 aperture. It can record videos at 720p. However the quality of images are quite disappointing. If the front camera is intended for just video calls, then you will be happy, but if you are looking to take those killer selfies, then you must get the Lumia 730. The device is powered by a 2200 mAh battery and it can be wirelessly charged apart from the regular USB charger. 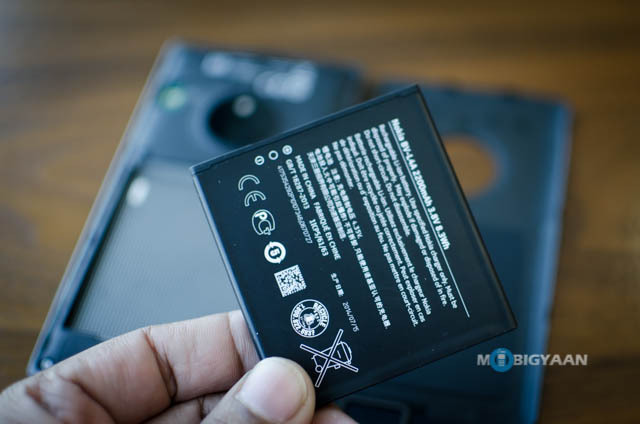 On a regular usage with 3G always on and a few calls with a few camera shots and some minutes of gaming, the battery juice lasts for a day. 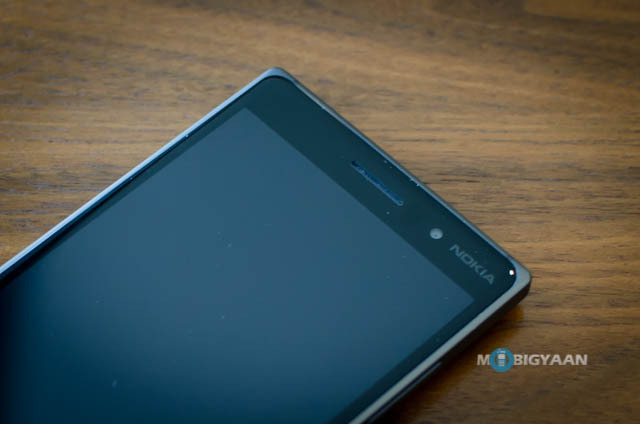 The Nokia Lumia 830 has a fantastic design and it is designed with a purpose. It is definitely a premium device and priced equal to a mid tier device. The price reduction has taken its bite off from the hardware specifications. But trust me, I have been having this mobile with me for over a month now and I never felt the constraints in hardware. If you blindly look at the spec sheet and say that there are Android devices with similar specs but priced low, I would say that this device is priced for its camera and design quality. The Lumia 830 is available at around Rs 27000 and it is definitely a good buy.